Campsite Cooking Equipment: The Ultimate Guide to vanlife cooking gear. That’s the question I posted to some Campervan Channels on Facebook and other social media. I was inspired by the variety of responses I received, which included many innovative and unique ideas that I’d never thought of, even after decades of camping and traveling. I decided to create a post with the most important categories of Campsite Cooking Equipment, with one or two reviews of the highest rated, most useful items available. Please consider this post a work in progress as we’ll be updating and adding on to it over time. Leave a comment and subscribe to post replies to get the updates as they happen, and include your favorite, must pack campsite cooking equipment in your comment. 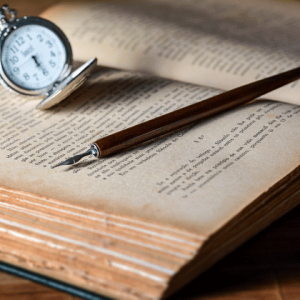 *a little orange arrow will appear lower right to return to top of page. I hate to sound like the perpetual worrywart, but we love you and want you to be safe out there on the road. So please consider that cooking means flames and gases and sparks (oh my) that you need to be mindful of so you and your family will have trouble-free meals and fireside time. Of course you need fire extinguishers within reach at all times in your campervan. 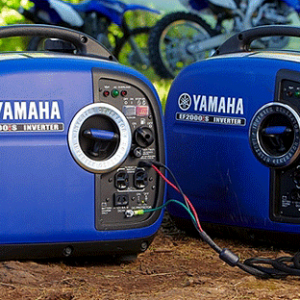 I suggest keeping one within a few steps of your fire pit, cooking area, stove, gas lantern… Any source of flame. Please take a minute to learn what are the fire extinguisher types and many other details about this important campervan safety gear.. Yes, we posted about these over here, but it bears repeating over and over again. Every season there are reports… and those horrible situations are totally avoidable. 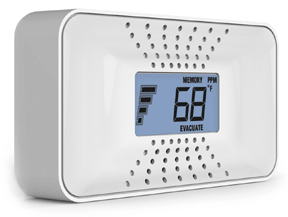 The First Alert CO710 Carbon Monoxide Alarm with 10-Year Battery and Digital Temperature Display or other highly rated O2 sensor should be installed in your van or rv. While we’ve already written at length about Best Portable Camping Stoves, we received a couple of suggestions for campsite ovens that merit mention here. I’ve only ever “baked” in a dutch oven (included under pots and pans here as it’s more of a pot, really), but now that I’ve been alerted to the concept of legitimate campsite baking, I’m planning to buy one of these. 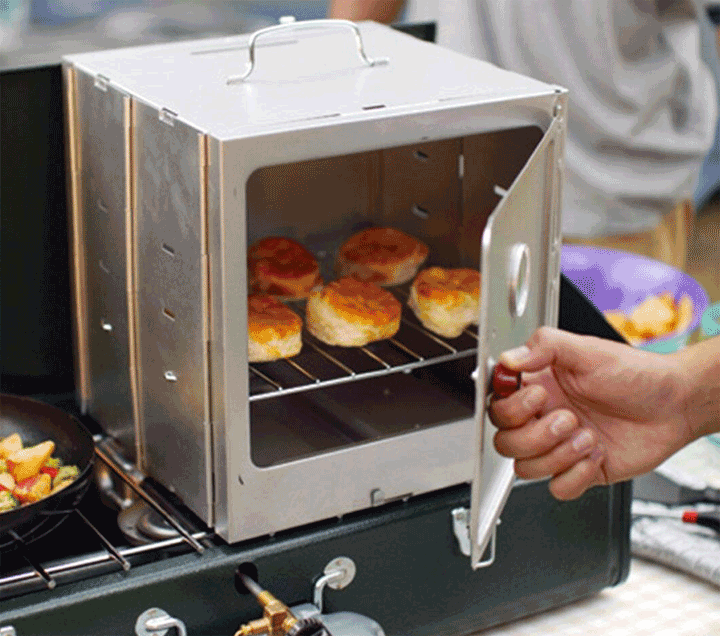 If you love to create fresh baked goods and miss them when on the road, you’ll want to take a look at these innovative, fun and useful campsite ovens. I’d never heard of the Omnia Stove Top Oven and we were excited to see that it has many reviews and is rated over 4 stars. A bit of searching lead us to the Omnia site, complete with recipes. Since I often camp along the west coast, I’m especially excited about the Shell Fish Lasagne. Another cool oven we were excited to see many Van Travelers using is the Coleman Camp Oven. 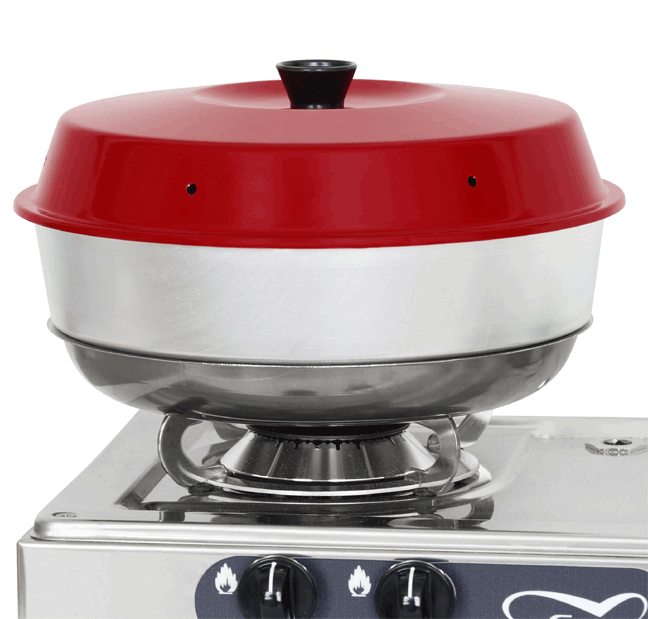 A more traditional oven approach than the Omnia, it sits atop your camp stove, using a single burner. 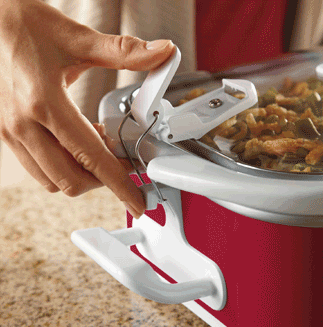 The Coleman allows you to bake just about anything you could in your home kitchen. I smoke meat, and I do it with charcoal and hardwood chips, so BBQ grills are among my favorite campsite cooking equipment. In my world, gas is for heating, while charcoal and wood are for flavor. 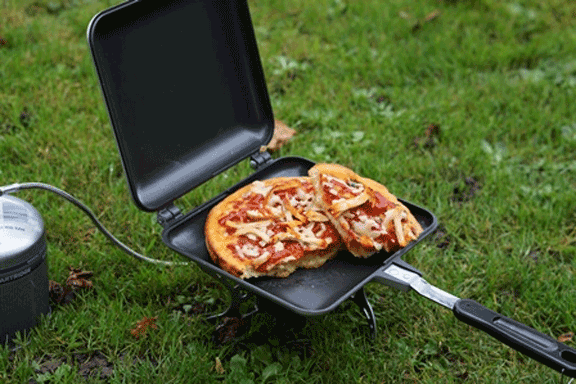 Now that I’ve started a war, I’ll suggest some of the best grills for camping. ﻿ If you’ve got the room in your rig consider the Weber Smokey Joe 14″ Portable. With a little practice, you can cook for several people on this rig and it performs with all the magic of the full size Webers. If space saving (can always go on the roof, or even in the box), is less of a concern for you or you’ve got more than 2 or 3 mouths to feed, you might consider stepping up to the Weber Jumbo Joe, the 18″ version of their grills for camping. 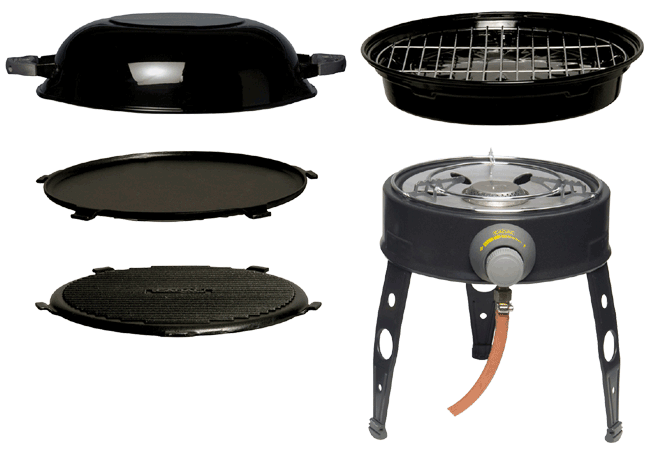 More than one reader mentioned the Cedac Safari Chef Gas BBQ and Wok, a product that I was not previously aware of and I have to say it looks like a lot of fun. 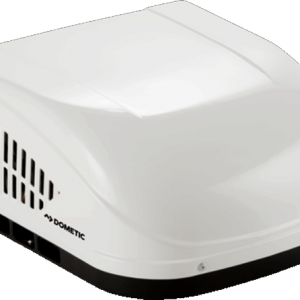 It fits into 3 of our categories: Grill, Stove and Pan system all in one. 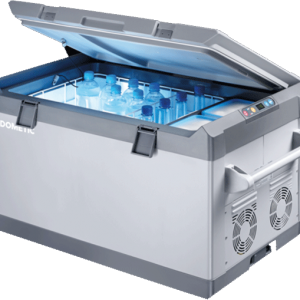 It features five interchangeable cooking surfaces; BBQ. Non-stick reversible griddle, wok and dome and it’s fully self contained with gas heat. We love the wok aspect and can’t wait to try this highly rated, innovative piece of campsite cooking gear. I love to slow cook while rolling. Plug the crock pot into the 120 volt inverter and let those ribs and onions and rice do their thing while I cover a few hundred miles. Arrive at the next campsite with dinner ready to serve, and plenty of leftovers for the next couple of days. 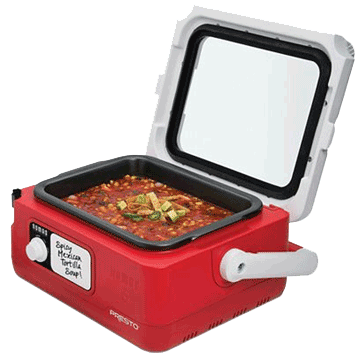 Below are two options for travel and campsite specific slow cookers from established makers of kitchen gear. I like this one for it’s reasonable size, perfect for a twosome and you’ll still have some leftovers. The locking lid is crucial to spill free driving. At six quarts, this one’s for serious family style slow cooking. Also with locking lid. When asked about campsite cooking equipment, nothing was suggested more by readers than the cast iron pan, and Lodge is the brand of choice. 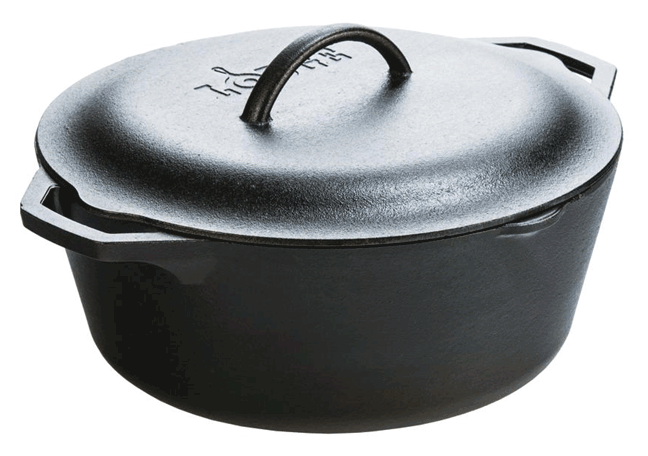 I’m a big fan of multipurpose gear for saving space, so I love the 3.2-Quart Lodge Cast Iron Combo Cooker as it’s a pot, a pan and a lid all in one. 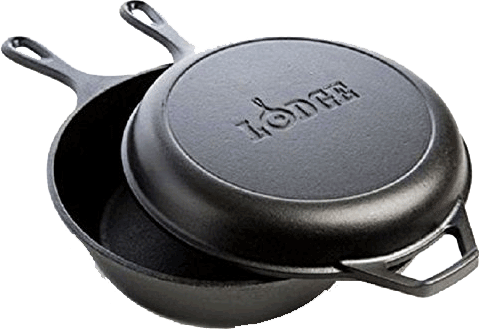 Other indispensable cast iron items include the simple skillet and once again, Lodge has you covered with their Seasoned Cast Iron 3 Skillet Bundle which includes the 12”, 10.25″ and 8” pans. I love this combo because it allows me to choose only the pan I need for a solo trip, or the whole shabang if I’ve got a crew to feed at the site. I’m a hiker and a mountain biker and a beach comber and a surfer and a stunt kite flyer and a… well, name your outdoor activity and I’m probably doing it. But one of the most overlooked outdoor activities is just sitting at camp with nothing particular to do. And while I’m doing that, I like to get some cooking done! (I do see the irony in that). 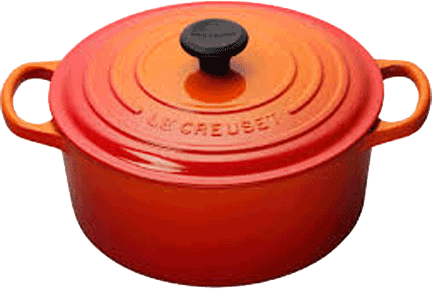 While there are many uses for the Dutch Oven, I like it for open flame cooking and for that reason, I like full cast iron vs enamel, as I don’t want to do any scrubbing to get soot off my pretty red or yellow enamel. So I prefer the Lodge 5 Quart Dutch Oven and the Lodge 7 Quart Dutch Oven. Below is a concise video that covers some of the history of the Dutch Oven, shows several variations of available shapes and sizes, and other fun stuff. 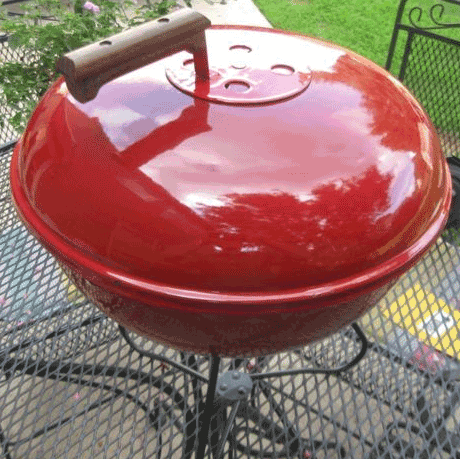 If you don’t plan on setting your Dutch Oven in a bed of coals or hanging it over a fire pit, you might opt for one of the enameled options. There are some really nice options out there. It’s nice to have some lighter weight gear on hand to quickly boil some water or heat up some soup, so we recommend a conventional nesting stainless campsite cookware set. With over 200 positive ratings, we love the durable, space saving, Stansport 7 piece Deluxe Cookset. It packs tight enough to be included in the van whether it gets used or not. Some folks had mentioned this and I dismissed it at first because I’ve always just used a pan or grill to toast sandwiches. But the RidgeMonkey is much too cool to skip. 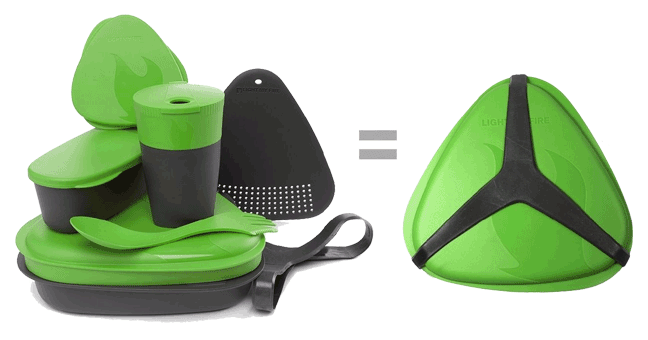 This little gadget meets all my criteria for packable, durable, highly useful campsite gear. Check out these Youtube search results to see how people are using the RidgeMonkey. I think EVERY Conversion Van Traveler who responded to our survey mentioned some type of caffeination delivery device. On a camping trip a few years back my girlfriend handed me a paper bag with miscellaneous kitchen gear in it and it slipped out of my hand. The cracking noise we heard was the glass french press, our only source of coffee for the weekend. Since then I’ve sworn off fragile gear on camping trips, started carrying a Stainless Steel French Press at all times and have never looked back. The French Press is arguably the most pure approach to extraction and it’s what I reach for when no espresso machine can be found. 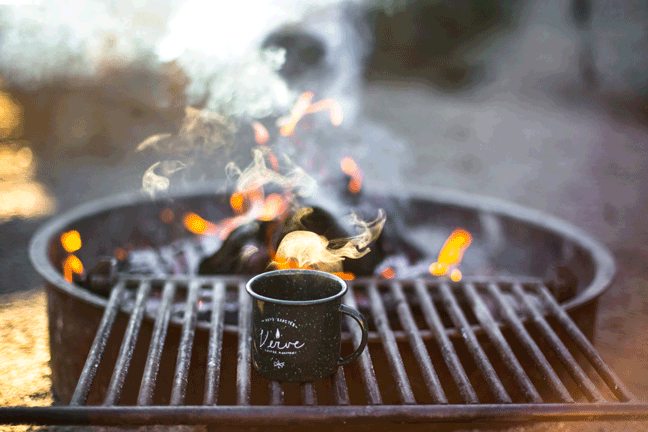 Here’s a couple products that we love and swear by for simple, delicious, trouble free campsite coffee. Another great press style coffee maker is the Aeropress. 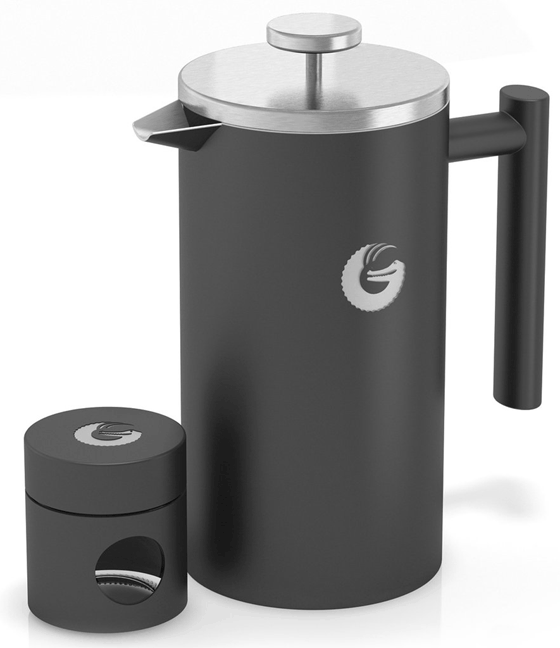 Simple gadget that delivers a great cup of coffee with minimal fuss. Many people swear by this approach to coffee. In fact, at the time of this writing the Aeropress has nearly eight thousand reviews and a rating over 4 stars. Wow! Fancy coffee isn’t for everyone. Many of us just need the black elixir delivered in the simplest way possible and our parents approach was just fine, thanks. 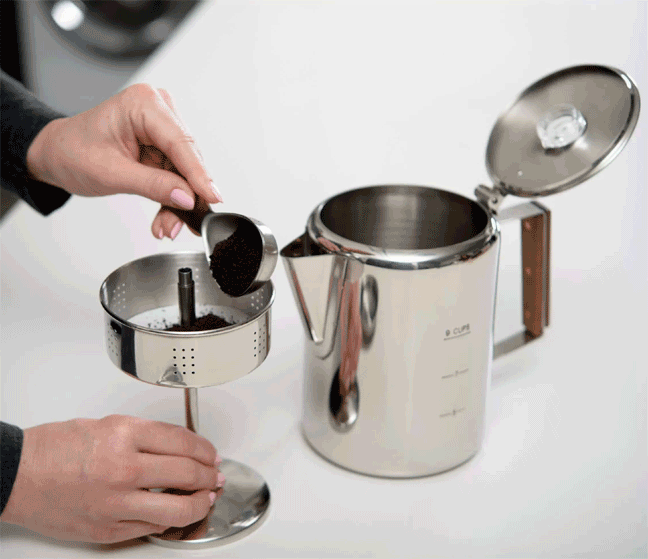 Good news, Coletti has you covered with the “Bozeman” 9 CUP Stainless Steel Percolator. As a native Seattleite, I’d be remiss if I didn’t offer up some options for making espresso while on the road in your campervan, so it’s time to pull out all the stops on the coffee issue and get super geeky. First in the lineup for campsite espresso makers is the ROK Presso Manual Espresso Maker. This is one of the most innovative manual coffee makers and would do just fine in any Van, or any kitchen for that matter. It’s perfect for the campsite because it’s fully manual so as long as you can boil some water, you can make a great cup of legitimate espresso. And if you’re like me, a complete nut case when it comes to coffee, you’ll want your beans freshly ground. We’re in luck because Rok also has a manual grinder. Take a look at their blog for more details on their stylish, durable, innovative products. I’ll be the first to admit that this next one is a bit obsessive and if I hadn’t made it work personally, I wouldn’t even mention it. When I know I’ll be on full hook up for a few days or more, I carry my La Pavoni Europiccola. 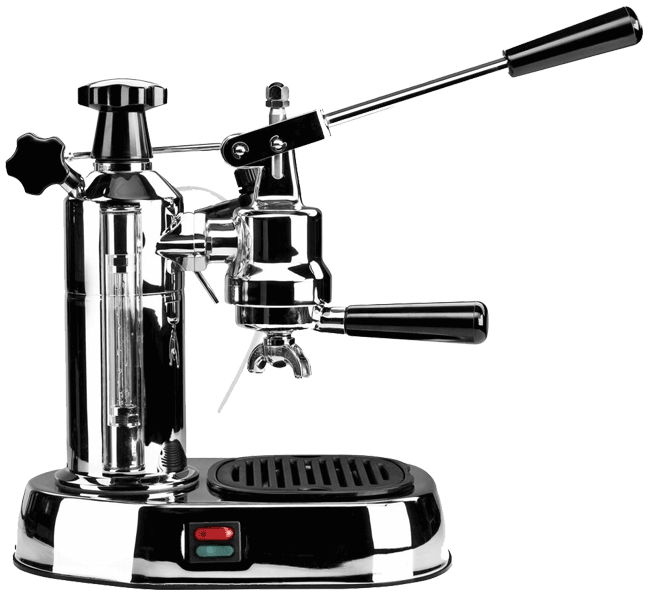 I love to pull great espresso shots for myself and others, and this little beauty gets the job done like no other home machine can. 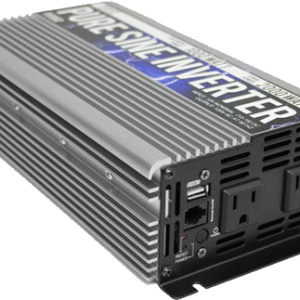 But it draws some serious power so if you don’t have grid quality juice, you’ll want to skip it. You’ve been warned. I’m not a tea drinker so I had to survey other campers and some folks on the VanSage team for these recommendations. I left out some of the pots with long, thin spouts as things like that tend to get bent in the bustle of packing and unpacking. 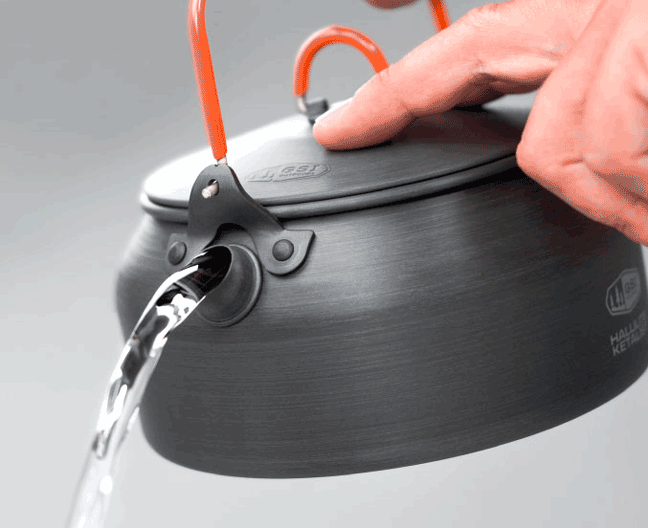 Docooler 1.1L Ultralight Camping Kettle: A nice size for a few cups and for packing away. Dltsli Silicone Collapsible Tea Kettle: Bit of an oddball but promises to be ultra compact and packable. GSI Halulite 1 Quart Tea Kettle: From a proven outdoor gear company. Very highly rated and affordable. We get right back to the issue of power usage with these products, but some of us are set up to blow a few hundred watts to get a few cups of boiling water. If you drink a lot of tea, coffee or need to boil water often for instant soup… a boiler will save on gas or other fuel. I avoid any electric device that’s not totally stable, so I’m leaving out products like immersion boilers. 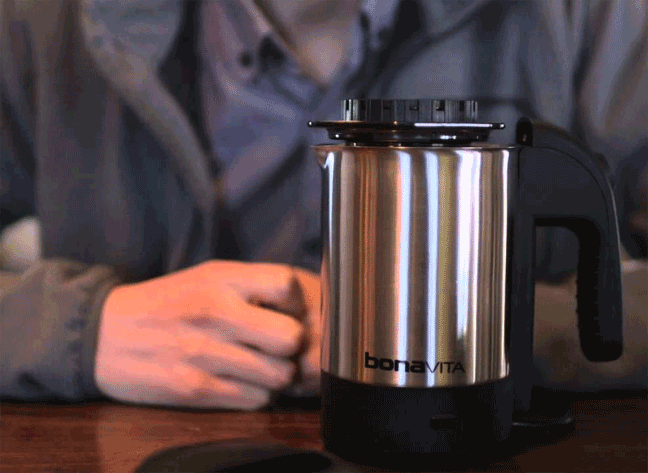 Bonavita 0.5L Stainless Steel Mini Kettle: At 900 watts, most inverters or power stations won’t be over burdened, and it’s a compact size. Intriguing generic brand travel boiler kettle that’s only 1000 watts and has some good ratings. The world of knives is vast and can be complicated. 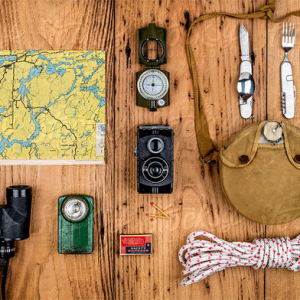 Many Van Lifers have a variety of knives in our lives and when it’s time to stock campsite cooking equipment, we grab whatever knife is handy and toss it in the kitchen box. But I’m here to tell you that your campsite knives should be chosen carefully for your unique needs. I’m not a fan of “hollow ground” knives when working with food as they tend to have a thick trailing edge, making thin and accurate slicing difficult. So the recommendations below will all be “flat ground”, as the best kitchen knives tend to be. I could get really into this section and I’ll likely do an entire post here at VanSage on it at some point. For now, I’ve listed some highly rated and useful knives for your van and campsite kitchen. Let’s start with a very serious “everyday carry” knife that doubles as your campsite pairing blade. The Fallkniven F1 with Zytel Sheath should not be casually handed to your camp mate without first clarifying the reality of its sharpness (true of any high quality blade that you keep sharp). The F1 is durable and beautifully designed with a comfortable, no-slip grip, an easy access sheath, and you’ll find it indispensable throughout your day, whether you’re prepping vegies, cutting twine or sharpening marshmallow sticks. If you’re more of a wizard with a can opener and a microwave than you are with a whisk and a chefs knife, you’ll want to skip the fancy blades and just make sure you have a small pairing knife and a slightly larger knife for chopping larger vegies like potatoes (see the 8″ Victorinox, below). At 3.34″, the blade is just right for all your pairing knife needs. If you’re doing any fishing, you’ll want to have a long, thin, flexible blade on board to make the most of those fresh fillets. 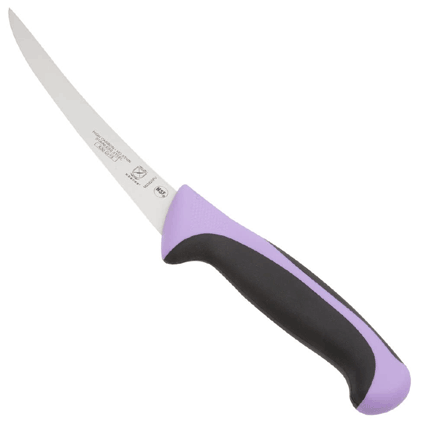 A good fillet knife can also be great for boning out a chicken or other small game. I love to stop at a local meat market on the way to the camp ground and pick up a rack of ribs or a couple of whole chickens for smoking, grilling, stewing in the Dutch Oven, whatever. Trying to bone out a chicken with a pocket knife is no fun, so the van always has a small cleaver on board. The weight and balance of a good cleaver calls up something primal and inspires great cooking. A word of caution about cleaver quality: You’ll see many inexpensive cleavers for sale on line and elsewhere. If you plan to use this tool as intended, with substantial force to chop through bone, you’ll want quality steel, a full tang design in a high quality handle and other features. 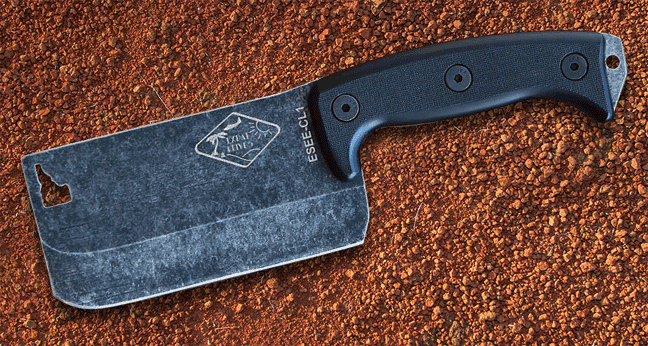 The Utopia 7″ Cleaver is a good quality, reasonably priced knife for all around heavy chopping. 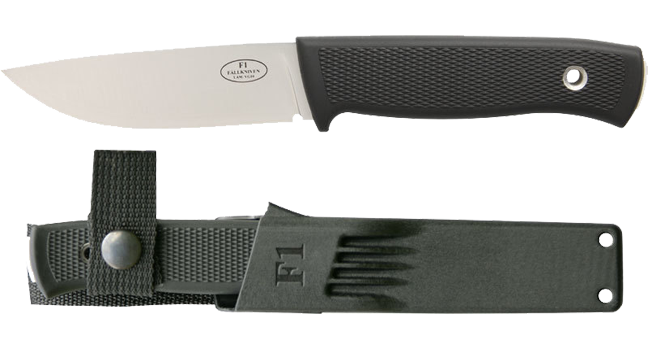 If you’re a hunter or planning to do any heavy meat and bone chopping at campground, the EseeKnives Expat CL1 might be the perfect campsite cleaver. Nothing worse than trying to get through a serious bread crust with a non-serrated blade. I’ve always liked the basic cooking knives available from Victorinox and this mid-sized (8″) serrated bread knife is perfect for packing in the chuck box. I don’t need a 10″ knife at the campground, but 6″ is too small for many tasks. Another great offering from Victorinox, their Fibrox Pro 8″ Chef’s knife is perfect for most cooks, pro or amateur. This little beauty is reasonably priced, durable and functional. Made for the home or pro kitchen, but not too precious for the campground and the van. A good cutting board, aside from taking a beating from a sharp knife, acts as a clean, portable surface on a public picnic table or even as a serving tray for fruit, cheese and other snacks. 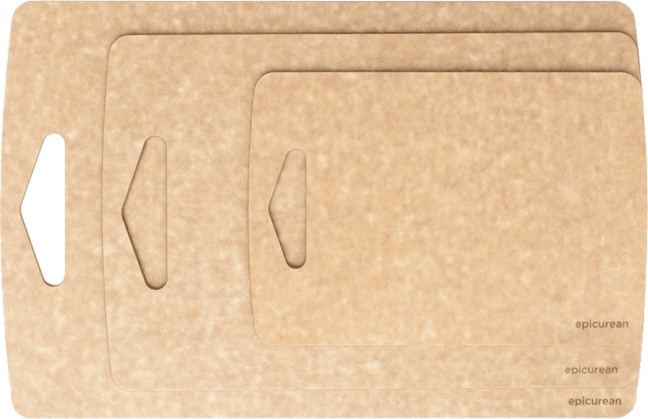 Here’s a great campsite and van travel cutting board kit that’s thin and durable. The variety of sizes can serve different types of trips. GSI rarely disappoints and their campsite table setting options are no exceptions. For when it’s just you for dinner, the GSI Outdoors Cascadian 1-Person Table Set will more than suffice. The GSI Outdoors Cascadian Table Set, 4 Place Settings is great for a small family or group of friends. Light My Fire is another steady source for camping gear. Their 8-Piece Meal Kit with Plate, Bowl, Cup, Cutting Board, Spork and More is a highly rated bargain for campsite tableware. For a total, no-brainer solution to setting a table for 4, the Stansport Enamel Camping Tableware Set is the answer. I love enamel for camping, btw. I’m a fan of all kinds of multi-tools, and a good spork will save a lot of digging through boxes of gear while the food gets cold on the plate. 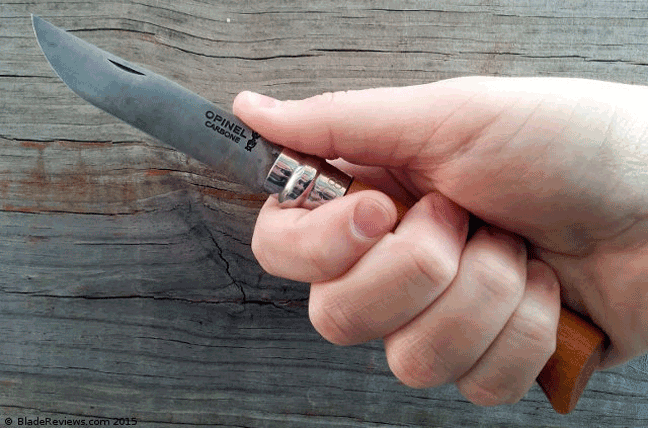 Light my Fire Titanium Spork: Over 1800 reviews and a 4.5 star rating! If you’ve got a brood to feed, consider the Tritan Sporks Spoon, Fork & Knife Combo with Bottle Opener & Carrying Case. 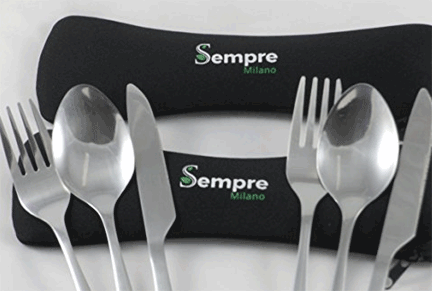 For more traditional table settings, pick up a few Sempre 3 Piece Utensils, all in a handy pouch. My van is small, but even I find it necessary to pack folding camp chairs sometimes. for example, if I’m going anywhere without picnic tables and I want to sit comfortably outside of the van to eat. There are no chairs or other seating on BLM and other off grid camping land, so one needs to arrive at those sites fully self supported. 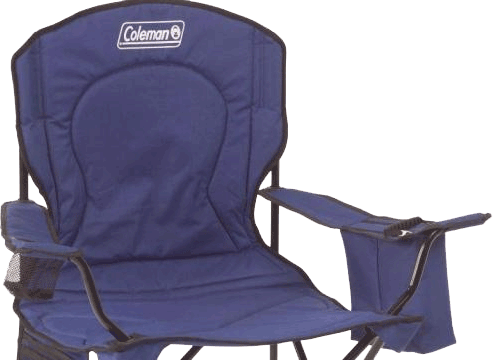 The wildly popular Coleman Oversized Quad Chair with Cooler is available in a range of colors, the price is great and the reviews are stellar. If you plan to cook for a group, be it family or friends, you’d better make sure they can sit down to enjoy your chefery. 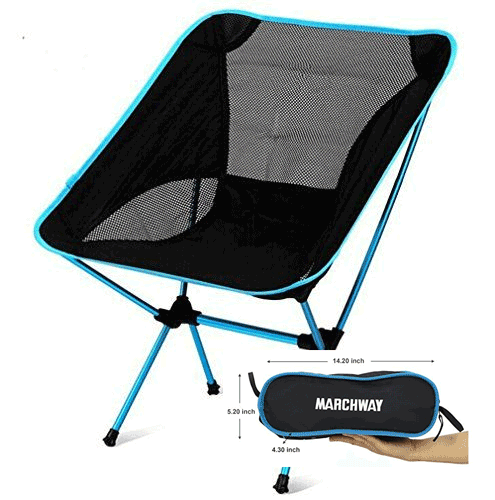 I went on a search for a more compact, space saving folding camp chair for when I need to pack two or more chairs and found this cool, packable chair in best sellers. 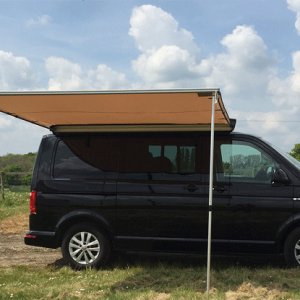 Many campervans have folding tables inside or as part of a tailgate chuck box, but outside seating can be a challenge. 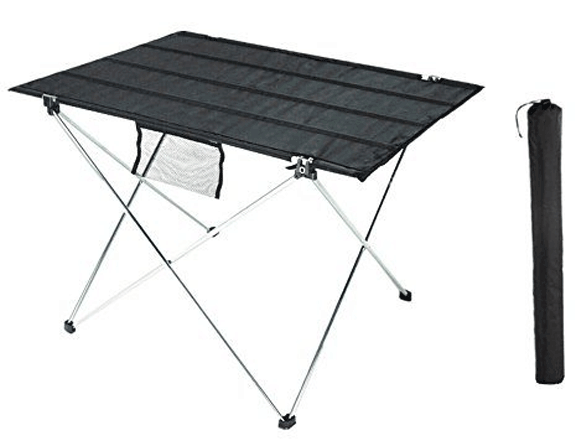 The Intey Folding Picnic Table is similar in size to a cafe two-top (29″ x 21″ x 20″) breaks down very compact and goes nicely with the folding chairs mentioned, above. It’s great to have a stable work surface, not to mention extra organization space. The Camp Chef Sherpa Table is a great piece of campsite cooking equipment that was created to solve both of those issues. 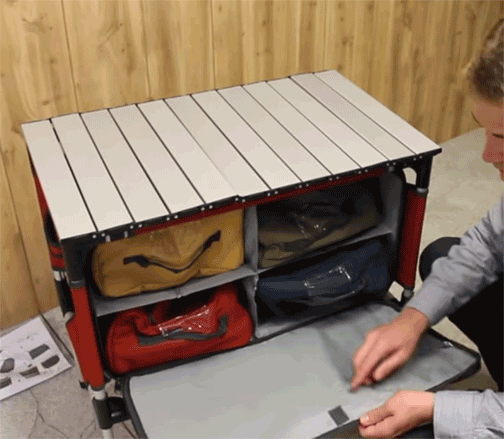 The Sherpa comes with four color coded storage bags and a solid work surface. Many campers leave it set up right in their rig and it’s light enough to carry out to the cooking area. We wrote a detailed post about lanterns for your campervan and your vanlife journey. You’ll find that over here. Take a look and let us know what you think. 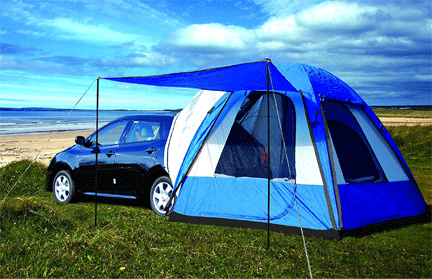 It’s a very useful post with a beautiful pictures, I prefer all the equipment for camping.